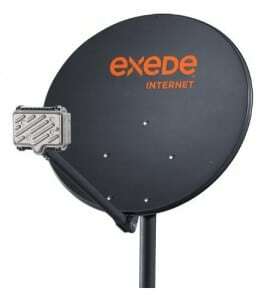 Exede satellite Internet service. Photo: ViaSat, Inc.
[Via Satellite 06-24-2014] ViaSat’s Exede high-speed satellite Internet service ranked first in the Federal Communications Commission’s (FCC) “2014 Measuring Broadband America” report for the second consecutive year. The report evaluates and compares results from 14 broadband providers to judge performance and service. According to the report, the Exede service delivered nearly 140 percent of its advertised upload and download speeds during peak periods. The findings represent about 80 percent of broadband connections in the U.S., evaluating Digital Subscriber Line (DSL), cable, fiber, and satellite providers alike. ViaSat was the only satellite provider that agreed to participate in the 2014 study. The Exede service has grown in the past two years to include voice phone service for residential subscribers, high speed In-Flight Connectivity (IFC) for airline passengers with Exede In the Air, speed and data plans tailored to business subscribers, and communications for live events, field operations, disaster response and news gathering with Exede Enterprise. The scheduled launch of the ViaSat 2 satellite in mid-2016 is set to further expand Exede service offerings.